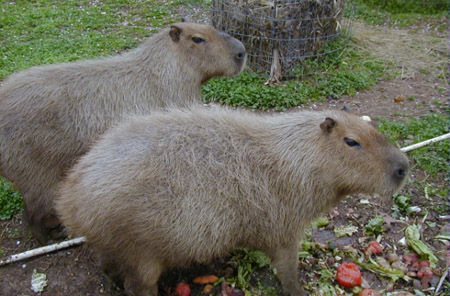 I’ve been posting about capybaras as far away as Malaysia and Moscow but somehow forgot to feature my own relatives in Arkansas! Go figure. Well, it is time I did something about that. So in this post, I would like you to meet all my great capbyara relatives and their owners, Mary Lee and Amos Stropes. Mary Lee also runs capybaras.org, probably the best site on the web for capybara information (next to this blog, of course). 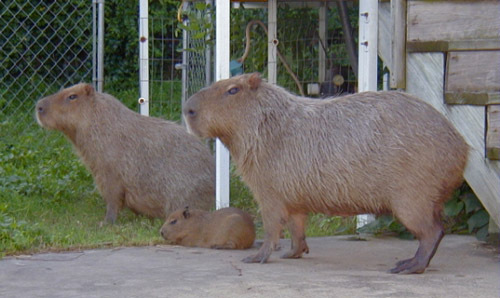 Mary Lee and Amos breed capybaras so they have lots of experience. 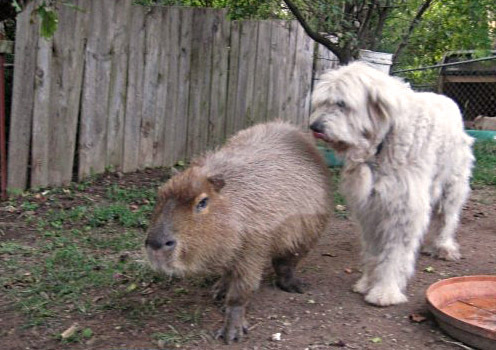 But enough about the humans, let’s get down to the capybaras. First, I’d like to introduce my Grandpa, Captain, he’s the one in the back, and my Grandma. Grandma’s name was Queen when she was alive but Mary Lee has renamed her Capalena in honor of me, her most famous decendent. Both Grams & Gramps came from North Carolina back in 1991. That makes Gramps 18 years old, which just might be a record for capybaras. I hope I inherited that longevity gene! Now here is a cute photo! This is my grandparents with my cousin Little. Little was their last baby and the only one in her litter. Isn’t she adorable? Maybe that’s why Mary Lee decided to keep her as a pet, kind-of like me only she is not allowed in the house. Here’s another shot of Little when she was little along with Gramps and Grams. Notice Gramps eyes! They are not just black pits like mine. Why didn’t I inherit that beautiful color? If you have been following my story, you will realize that Little and I are fairly closely related. In fact, we are first-cousins-once-removed. So you’d think we have a lot in common. But here’s another thing, besides the eyes, that we don’t have in common. Little has a pet dog named Bosco. I’m not saying a dog is a better co-pet than a rabbit, but Bosco is a lot bigger than Maple. From that photo, you might also notice something else different about me and Little, but this next photo will make it more obvious. 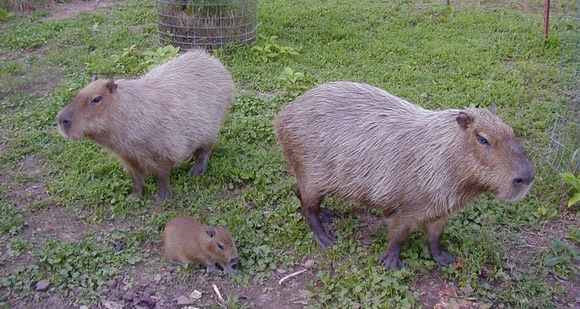 By the way, Mary Lee is writing a book on how to keep capybaras that should be completed by the end of the year. 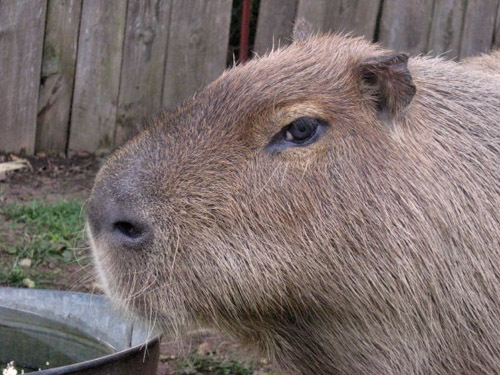 It will be the first book available on that topic so if you’re interested in getting a pet capybara, make sure you check her site for more information as it becomes availabe. (Of course, I’ll also post here when the book becomes available.) 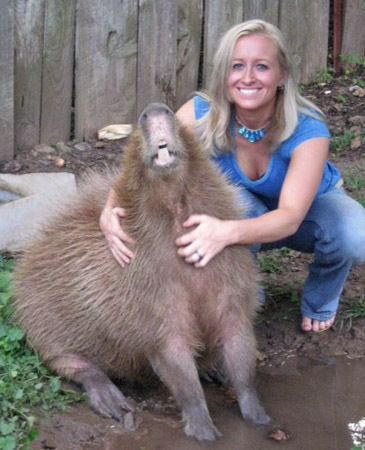 The book will also feature fun and funny stories about capybaras that Mary Lee has accumulated over the years and interesting facts about wild capybaras and our predators, including humans. If you live near Cornwall you are in luck. 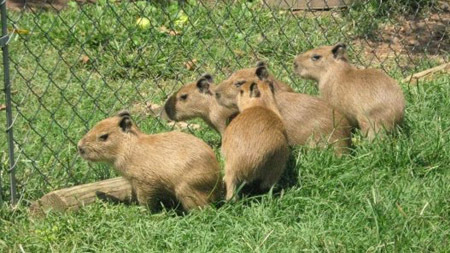 The Newquay Zoo has three baby capybaras! And they are going to keep them on display so you can watch them grow.